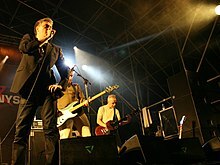 The Undertones (with Paul McLoone) on stage in Barcelona, Spain in September 2007. The Undertones are a punk rock/power pop band from Northern Ireland. They formed in Derry in 1975. This page was last changed on 11 September 2018, at 05:13.